Author Bruce Levick captures the essence of Peter Harcourt’s earlier books on Wellesley (1989) and Croydon (1990) and adds new insights before traversing the school’s last 25 years. He brings Wellesley brilliantly to life with humour and fascinating detail. Bruce writes about many of the characters and stories that make up Wellesley’s history, setting them in the context of the socio-economic fortunes of the times. For every story told or character described, there are hundreds more — they are for another day. By the end of this book marking the centenary year, the reader is left in no doubt there is plenty of history ahead. 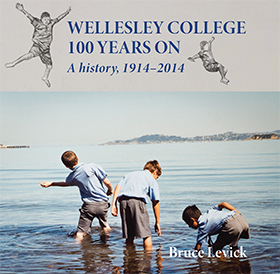 The history of Wellesley College from 1914 to 2014. Soft cover, 192 pages with many photos. First published October 2014 to mark the college's centenary.